Baroness Béatrice de Rothschild constructed Villa & Jardins Ephrussi de Rothschild between 1905 and 1912. Each of the villa's nine lush gardens has a unique theme: Florentine, Spanish, French, exotic, a stone garden, Japanese, rose, Provençal, and a garden de Sèvres. Formed under the direction of landscape architect Achille Duchêne, the gardens form the shape of a ship, meant to be viewed from the terrace of the house. The shape was inspired by the architect's voyage on the liner Île de France. The original gardeners were dressed as sailors, wearing berets with red pom-poms. 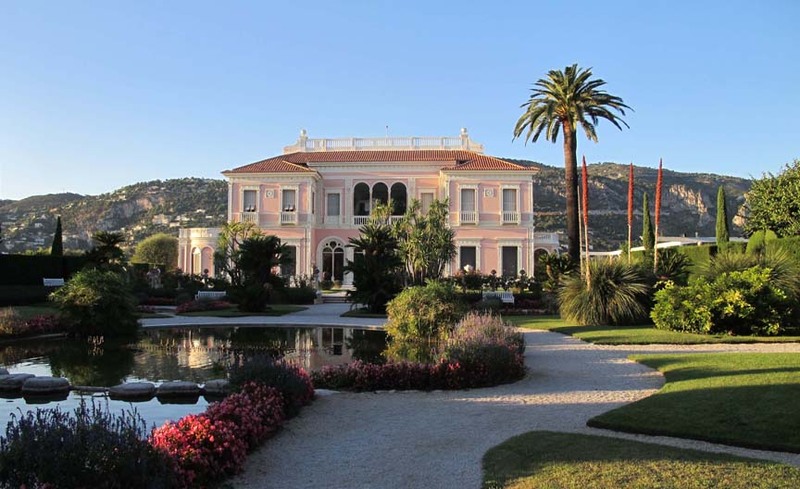 Work out when and for how long to visit Villa & Jardins Ephrussi de Rothschild and other St-Jean-Cap-Ferrat attractions using our handy St-Jean-Cap-Ferrat trip planner. Beautiful house in lovely gardens with amazing views. It's not the easiest place to find, but the lady working in the tourist office was very friendly and helpful. She gave us a free map and marked the way on the map. The entrance charge is I THINK 15 euros (double check that as I'm not 100% sure) and the restaurant is rather posh and pricey, but the service was friendly (we only had coffees). The house itself is lovely, with lovely views from all sides of the house. The gardens are beautiful, and there is a 'dancing fountain' which changes in time to classical music and is very impressive and entertaining. I'd highly recommend a visit. Beautiful villa with amazing garden! At first I thought 15€ entrance was a lot, but then I saw the garden, totally worth it! It’s really well kept and the views are amazing from there! Beautiful place. A lot of exotic plants and typical herbs. Really love it. Audio guide is very informative you will find out a lot of about history and construction of this place. Every day, we help thousands of travelers plan great vacations. Here are some tips on how to use your Listing Page to attract more travelers to your business - Villa & Jardins Ephrussi de Rothschild. Promote your permanent link - https://www.inspirock.com/france/st-jean-cap-ferrat/villa-and-jardins-ephrussi-de-rothschild-a79257865 - on your website, your blog, and social media. When a traveler builds a plan from this page, the itinerary automatically includes Villa & Jardins Ephrussi de Rothschild. This is a great way for travelers looking for a great vacation in your city or country to also experience Villa & Jardins Ephrussi de Rothschild. Promoting your link also lets your audience know that you are featured on a rapidly growing travel site. In addition, the more this page is used, the more we will promote Villa & Jardins Ephrussi de Rothschild to other Inspirock users. For best results, use the customized Trip Planning Widget for Villa & Jardins Ephrussi de Rothschild on your website. It has all the advantages mentioned above, plus users to your site can conveniently access it directly on your site. Visitors to your site will appreciate you offering them help with planning their vacation. Setting this up takes just a few minutes - Click here for instructions.